I absolutely love that Emma Ramey is old enough to celebrate the holidays with fun, hands-on activities this year! We kicked off the holiday season recently with a create-your-own snack. Emma Ramey’s cousin Avery just happened to be in town at the time, so both girls got in on the fun! We know that kids’ activities can get messy this time of the year, but all of the holiday fun can also spread cold and flu viruses. It’s so important to stay healthy this time of the year. Not only did we have the girls wash their hands with warm soap and water before and after making our jack-o-lanterns, but we used Clorox wipes to keep our kitchen clean and germ-free for the activity so we can be healthy for the next fun holiday activities! We made Cereal Treat Jack-O-Lanterns. It’s your same old cereal treat recipe, but with a fun twist! Microwave the butter and marshmallows in a large microwave-safe bowl for 2 minutes. Stir – if still not melted, microwave for 1 more minute. Mix the rice cereal into the marshmallow mixture well. Let this cool for about 5 minutes. Scoop 1 cup increments of the cereal mixture onto wax paper. Once cool enough to form, spray hands with cooking spray and form chunks of cereal mixture into balls. Now’s the fun part! Let your kids decorate each “pumpkin” with the candy. I cut the chocolate kisses in half and used those as the eyes and nose…the candy corn was the mouth. We used the chocolate-covered raisins as the stem! We loved snacking on these just as much as we loved making them! The recipe made 6 total “pumpkins”…but we saved one to snack on during decorating. 🙂 These aren’t perfect by any means, but they aren’t supposed to be perfect with an 18 month old and a 2 1/2 year old. Just have fun! After the fun, of course it’s important to clean up the mess. We used Clorox Disinfecting Wipes to clean the messy, marshmallow-laden kitchen! Clorox® Disinfecting Wipes disinfect twice as much surface as the other leading brand*, so you are getting a fabulous value for your money…no choosing between holiday fun and keeping your home healthy! 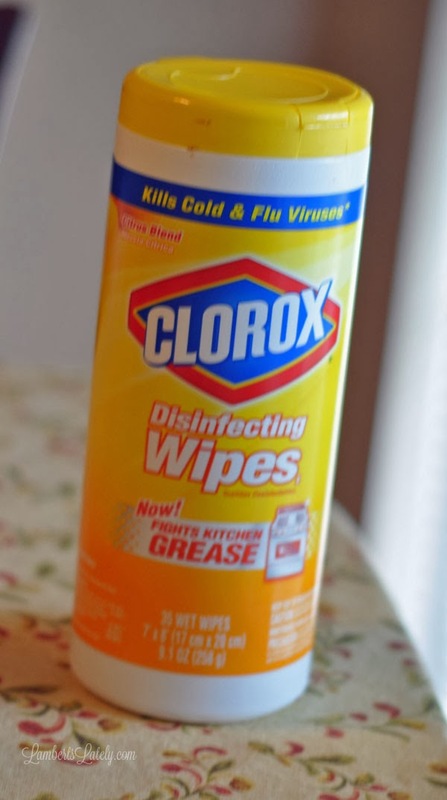 Clorox also offers On-the-Go wipes to use during travel, another source of germs during the holiday season. These can be used to disinfect hard surfaces in the car, bus, train, or plane…some of the biggest sources of germs during the holiday season. Genius!